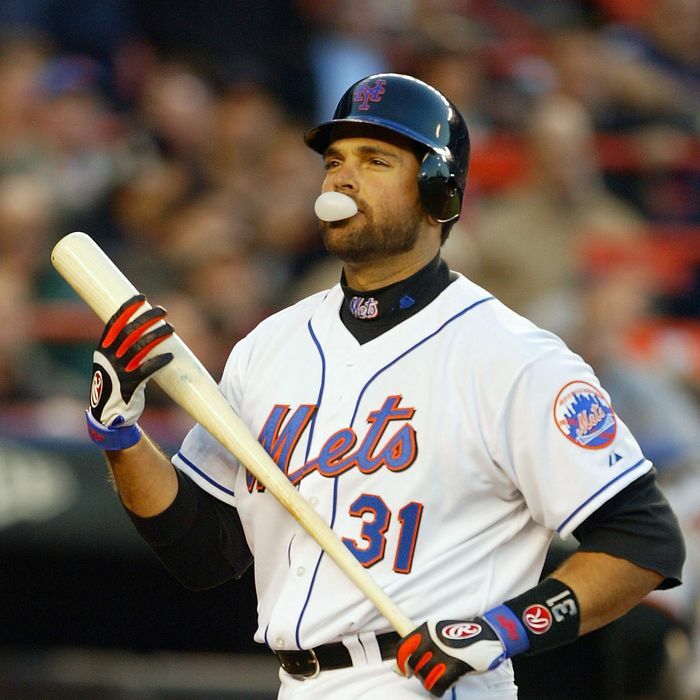 Mike Piazza’s name first appeared on the Baseball Hall of Fame ballot last year, when the writers collectively made their big statement about the steroid era by not voting in anyone. Piazza, quite possibly the best-hitting catcher of all time, was named on 57.8 percent of ballots, 98 votes shy of the 75 percent threshold required for election. His credentials would have made him an obvious first-ballot Hall of Famer — his offensive numbers more than make up for his defensive issues — but too many writers suspected he took performance-enhancing drugs. (The allegations against him come mostly from a few paragraphs in a book by Jeff Pearlman and the fact that Murray Chass — whom we’ve discussed far too much already — noticed that Piazza developed bacne.) Last year, Piazza wasn’t kept out of the Hall of Fame because he took PEDs. He was kept out because writers suspected that he took them. And now that the 2014 election results have been announced, we know that the same thing happened again this year. Voting — Voting shall be based upon the player’s record, playing ability, integrity, sportsmanship, character, and contributions to the team(s) on which the player played. Whether Piazza deserves to be lumped in with known steroid users is a separate conversation (thought it should be a short one, because he doesn’t deserve to be). But putting that aside for a moment, writers who choose to play morality cop will justify it by pointing to those words, and claiming that they’re merely strictly adhering to the guidelines. That’s bad enough, but what makes it worse is that there are many, many instances of writers who conveniently choose to ignore those guidelines at other times. Some writers throw a vote to an undeserving player because he covered him personally during his career, even though a player’s “record” and “playing ability” would seem to be the most important factors. (Among those receiving a vote this year: Armando Benitez and Jacque Jones.) Others leave an obvious Hall of Famer off the ballot in his first year of eligibility for reasons that have never fully made sense to us. (Greg Freaking Maddux didn’t get 100 percent, though at least he’s in good company, as no player ever has.) It’s not fair to paint all writers with the same brush — some of them vote smartly and fairly, whereas others commit multiple voting sins — but it’s apparent that the system in place is deeply flawed. Some of the issues (like some clowns not voting for Maddux) ultimately won’t matter. But to keep Piazza out of the Hall of Fame is a real shame. • Craig Biggio’s name appeared on 74.8 percent of the ballots, missing the cut-off by just two votes. • Mike Mussina, considered something of a borderline case, didn’t come close to induction, with 20.3 percent. • Sixteen writers didn’t vote for Greg Maddux. Sixteen! • Roger Clemens and Barry Bonds saw their percentages drop slightly, to 35.4 and 34.7, respectively. • Jack Morris got 61.5 percent of the vote in his final year of eligibility on the BBWAA ballot.